Died: March 9, 1816 (aged 69) / Beekmantown, New York state. 7 years of service in the Continental Army (1775–1783) as a Captain and then Major for a pension. -In 1780, his regiment was sent to Albany to guard the frontier against Iroquois attack. 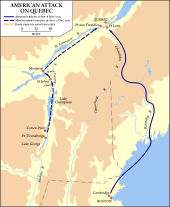 -After the arrival in July 1780 of the French Expeditionary Corps (6,000 men) commanded by General Rochambeau and the support of the French Navy Admiral de Grasse, his regiment and several others under the command of Lafayette receive the order to proceed to Yorktown in southern Virginia. -On October 4, 1781, he was severely wounded in the leg during the Siege of Yorktown, due to wood splinters sent flying by a cannonball. Media: Gosselin was featured in the CBC Television series Canada: A People’s History as one of a number of French-Canadians who not only sympathized with the American cause but was willing to fight for them against the British.